Are you Adventuresome? Creative? Colorful? Fun Loving? Exciting? Or are you Demure and Shy? Serious and Studious? Classic and Refined? A Person of Mystery and Intrigue? 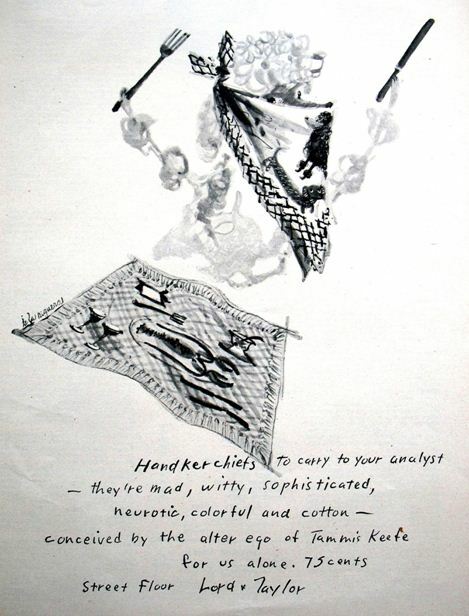 In case you think I’m exaggerating the influence of the handkerchief on fashion,(see history) take a gander at this full page ad in the June 28, 1947 issue of The New Yorker. A full page was no small commitment, and it features – not a Mainbocher suit, Christian Dior gown or Lilly Daché hat, but a handkerchief. Yep. A simple square of cotton. And yet….it’s described as mad, witty and sophisticated! The subtext being of course, that you too, will exemplify these qualities if you’re clever enough to add one of these hankies to your wardrobe. In 1947, when this ad ran, the world was still rebounding from WWII. Women who had recently been buying groceries with ration stamps believed splurging on a new outfit to be frivolous. Many found themselves supporting relatives who fled Europe with nothing but the clothes on their backs. Others were squeezing every nickel to support infants born during this “baby boom”decade. Ladies indoctrinated in the habit of “Use it up, Wear it out, Do with less or Do without” were slow to change. Yet, post-war was also a time of thankfulness and hope, of new beginnings and looking on the bright side. Years of unselfishness deserved a little reward. Nothing fancy, something small, colorful, and fun, purchased either as a salvo for saving and sacrificing, or simply to brighten a gray day. The hankie was the perfect solution. It could change your outfit, brighten your mood, enhance a little flirting, or simply make you feel feminine and special. 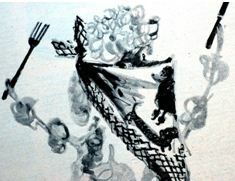 In this ad, a silly poodle wears a kerchief adorned with his likeness, as he anthropomorphically raises his knife and fork in anticipation of a sumptuous feast. Created by artist Tammis Keefe, the colors are rich, robust and completely unexpected. 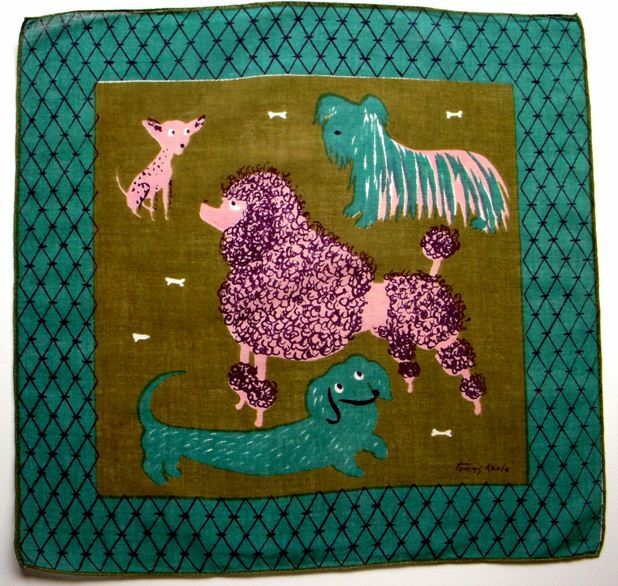 Keefe was known for her dramatic use of color, and the deep olive and rich turquoise make a perfect backdrop for the silly pink pups. 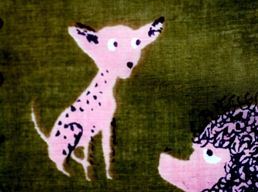 The slashes of pink on the shaggy dog, add “just enough” to emphasize his shagginess and sense of fun. No doubt about it, these critters have personality plus. From the wary sidelong glance of the tiny Chihuahua to the world weary, patient stare of the poodle, which belies his thoughts of “Must I stand here as the center of attention and be admired yet again? Oh alright. Fluff my curls, please….” right down to the “let me please you” smile on the dachshund. 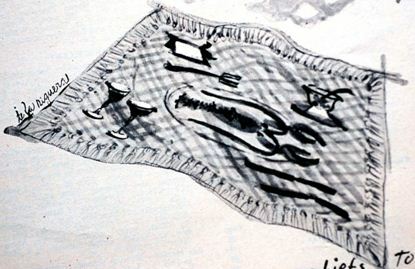 Then I took a gander at the repast set before our carnivorous canine – oh my – lobster and red wine on a lovely fringed checkered cloth, complete with engraved sterling and a place card. No paper plates and plastic cups here. If we’re going to indulge, than let’s do it right! Sure enough, I have that hankie too. 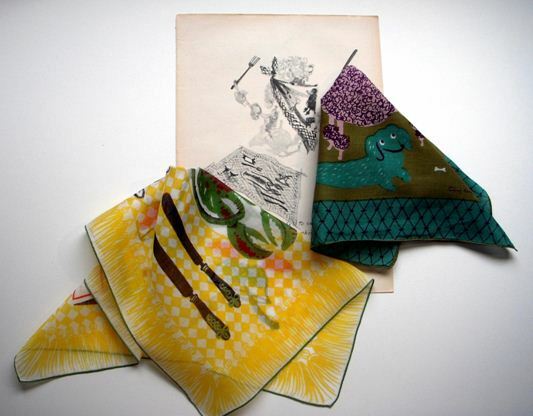 My archives do not encompass the range of more serious collectors, so it was doubly fun to find the second handkerchief among my stash. 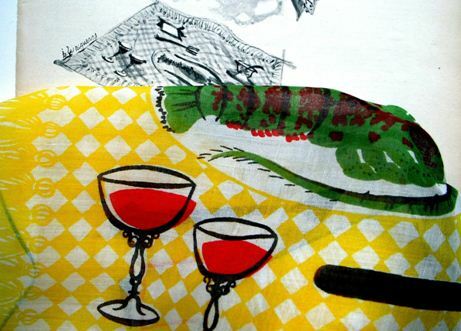 The seafood picnic hankie is cheery and fun, and just the ticket when you’re ready to indulge with a bright splash of color. Note the lobster has yet to take the plunge into the pot. 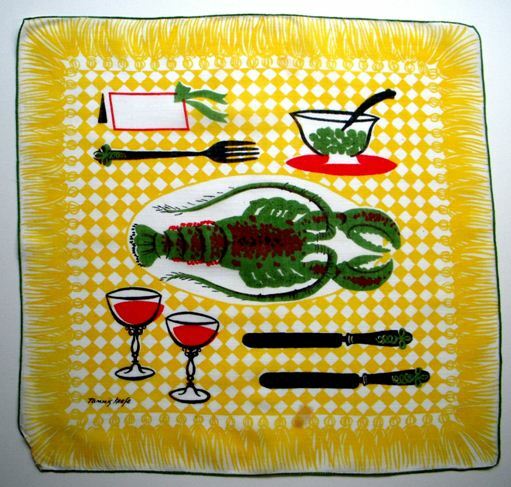 The use of the green and maroon colors of a live lobster is surprising, yet perfectly sets off the red in the wine glasses, the border on the place card, and the plate under the peas. Rather than have a giant crimson lobster plopped front and center to steal the show, all the design elements combine equally for balance, allowing your eye wander, savor and enjoy the entire meal. You may have noticed what looks like a spot beneath the knife, or spied a turned and mended corner. Yes, those are flaws. (an example of wabi-sabi) But the hankie is 65 years old. It’s earned every nick and scratch. I’m so glad someone took the time to mend it, rather than toss it. Perhaps it holds memories of a grand celebration in Nantucket or special birthday picnic on Martha’s Vineyard. We’ll never know. But we can enjoy it as much today as did the original owner. It’s great fun when you can find something to support the provenance of your pieces. On the reverse side of The New Yorker ad, note how the phone numbers are written. This was in the era before area codes. And what was playing on Broadway? Brigadoon and Finian’s Rainbow, among other shows. (Note the descriptions of “fantasy” and “whimsical.”) People needed a respite from years of sacrificing, whether it was Broadway show, or a jaunty hankie to buoy their spirits. Before we bid our dining dog adieu, let’s peruse the copy a bit more closely. It was groundbreaking for its day. Certainly people were aware of Sigmund Freud, Carl Jung and others, even if they had not read their works. Folks may have been introduced to the term alter ego when reading The Strange Case of Dr. Jekyll and Mr. Hyde. Yet to refer to “visiting your analyst” was very cutting edge. Seeing a “shrink” was kept strictly hush-hush well into the 1960s. Yet this ad, twenty years prior, portrays visiting your analyst as a normal routine occurrence. Really interesting concept. 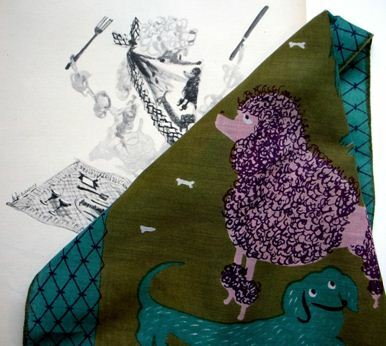 Different from other hankies blogs. Both this blog entry and the Lord and Taylor ad are worth thinking about. A little square of cotton can carry one a long way- into the fashion world and to one’s analyst’s couch.